The Florida Congressman has a history of voting for government shutdowns over spending standoffs. Another fight over spending and immigration could be looming in Congress, and a big question is whether it will happen before or after the midterm elections. Many Congressional Republicans want to delay this fight to eliminate the possibility of a highly unpopular government shutdown weeks before the November elections (the deadline is Sept. 30). But President Trump may not share that sentiment. He posted a series of tweets in the final days of July threatening to shutdown the federal government if the spending bills passed by Congress do not adequately fund his border wall, adding that he doesn't care "what the political ramifications are." Some have dismissed the tweets as bluster, but after a campaign stop in Miami on Monday, DeSantis backed the president, saying it was a tactic to get Congress to cooperate. "In the Congress we should be funding this wall. Part of it is about illegal immigration but honestly for me a big part of it is the drugs coming in," he said in a gaggle with reporters. "You have fentanyl and all this stuff coming in. This is very deadly stuff." "What he (Trump) should do … I urged him to veto the omnibus last time," DeSantis added. "Congress keeps doing the same stuff over and over again and I think if he says, 'I'm willing to veto something,' that actually would light a fire under someone's rear end." 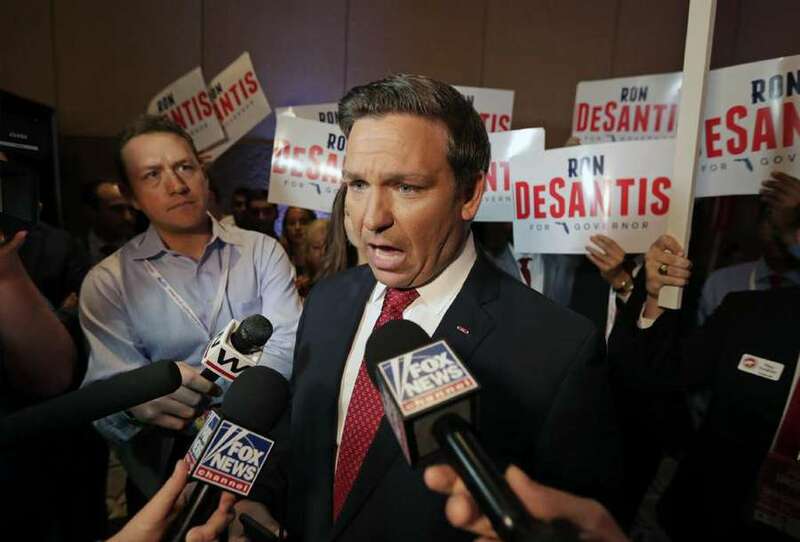 DeSantis has recently become the front-runner in the Republican race for Florida governor, recently overtaking Commissioner of Agriculture Adam Putnam shortly after DeSantis was formally endorsed by Trump. DeSantis's voting record in Congress shows a history of voting against omnibus spending packages. This often meant voting for a government shutdown rather than cede ground on his hard-line ideology. Read more: Defending Trump, threatening shutdowns: What 5 years in Congress tell us about Ron DeSantis. It's a trademark policy position of the ultra-conservative Freedom Caucus in the House, of which DeSantis is a member. Some national media outlets have reported that the Freedom Caucus could also be angling to bring the fight over spending before the election, seeing a battle over immigration as an opportunity to re-energize the base. DeSantis did, however, vote for one major spending deal in February, after he had announced his run for governor. The bill raised spending caps but also contained major funding for Florida's citrus industry to aid in hurricane recovery post-Irma. Government shutdowns are very unpopular with the American public, regardless of party. Last time it happened — in January after a Senate standoff over "dreamers," or undocumented immigrants who were brought to the U.S. as children — 84 percent of voters said the shutdown was "mainly unnecessary," according to a Quinnipiac University National poll of 1,245 people via phone. In past federal government shut downs, national parks in Florida had to cutoff services, members of the National Guard were furloughed, disabled veterans had trouble filing claims and federal shipments to food banks to feed nearly a million residents in South Florida were interrupted. The House is in recess until early September. Congress could end up passing short-term funding bills for some federal agencies, called "continuing resolutions," and save the battle over immigration policy for post-elections. However, Trump can veto those if he chooses. Both parties have been making unusual progress lately in crafting bills to fund each government agency. However, the House and Senate rejected bills earlier this year that included the types of immigration policies and border wall funding that the White House has sought.